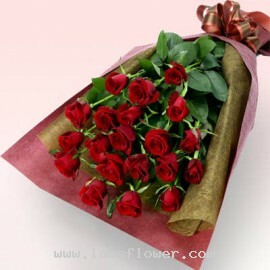 20 roses A bouquet of 20 roses delivered this message "My feelings for you is a truly heartfelt""My feelings for you is a truly heartfelt "
20 assorted color roses in a vase consist of red, pink, white, yellow, orange, etc. The color of roses can be changed as you want. Occasionally, substitutions may be necessary to create your bouquet due to the availability of certain flowers in various parts of the country. 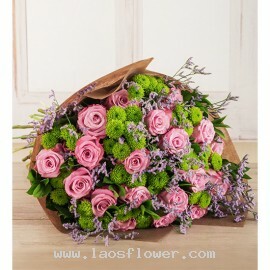 Substitutions may be n..
A bouquet of 20 pink roses accent with green buttons and purple caspia. Wrapped in brown paper and tied with a bow. * Customers can change the color of flowers and materials used. 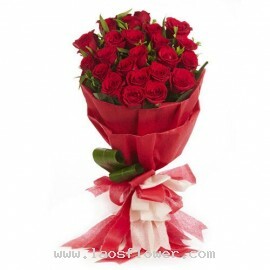 By notifying us when ordering flowers. Occasionally, substitutions may be necessary to create your bouquet due to the..
A bouquet of 20 red roses wrapped in red paper and decorated with a red and white bow tie. 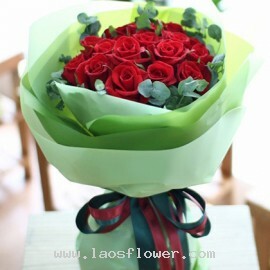 The color of roses, paper, and ribbon can be changed. Please let us know when ordering or by email. Occasionally, substitutions may be necessary to create your bouquet due to the availability of certain flo..
20 Red Roses & 8 White Lilies arranged in a vase accents with eucalyptus leaves and other greens. The vase decorated with red mesh and white ribbon. 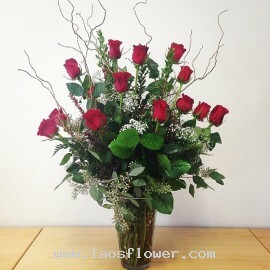 Occasionally, substitutions may be necessary to create your bouquet due to the availability of certain flowers in vario..
A bouquet of 20 red roses arranged to show on one side. Wrapped with brown and red paper and tie with a red & brown bow. You can change color of the roses and wrapping. Occasionally, substitutions may be necessary to create your bouquet due to the availability of certain flowers in various pa..
20 red roses in a clear glass vase accents with eucalyptus leaves and other green leaves and tied with red ribbon. The color of roses and materials used can be changed to any color you want. 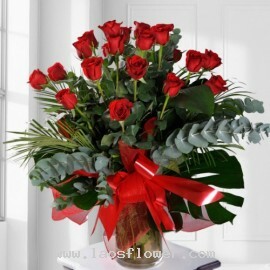 Occasionally, substitutions may be necessary to create your bouquet due to the availability of certain flo..
A bouquet of 20 red roses arranged in round shape and accent with eucalyptus leaves on the side. Bouquet wrapped with several layers of pale green paper and tied with 2 colors ribbon. Occasionally, substitutions may be necessary to create your bouquet due to the availability of certain flowers in..
A vase of 20 red roses accents with white gypsophila flowers, green leaves and vines. 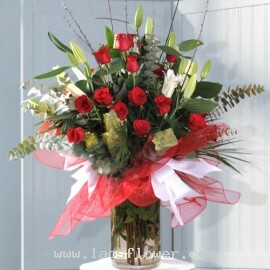 This vase is perfect to send as a gift for 20th birthday or wedding anniversary. * We will add a bow on the vase. 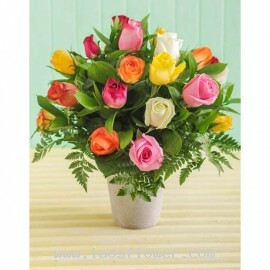 Customers can choose the color of roses, such as white, pink, yellow, orange, purple or peach. Oc..